Still remember the Amazon kindle Fire? When released in 2011, this beautiful tablet attracted people throughout the world because of its low sales price. On Wednesday of June 18, 2014, Amazon brought its first smartphone to us – Amazon Fire Phone. In spite of those new features such as, 3D display, unlimited storage space and object intelligent identification, what phone users care about is those common experiences. Some may question “Can I copy movies to this device?” or “It is able to directly play movies downloaded those video website?” The most important part of a smart phone is convenience and facilitation, file format compatibility with Amazon Fire Phone is way essential. What are the file formats supported by Amazon Fire Phone? If you find format of your movies or music is not supported by Amazon Fire Phone, an audio/video converter will help you out. New to Amazon Fire Phone? Here are some tips and tricks for you. How to use Amazon Fire Phone Firefly? Since the release of Amazon Fire Phone, one of most remarkable features is Firefly technology. It can instantly indentify phone numbers, webs, email addresses, music, movies, TVs, and over 70 million products. Really powerful and smart! Hold down the Firefly button (the third tab on the left side of your phone) to launch it. When the app starts running, point your phone camera to the item you want to identify, and then Firefly will process the item in the Cloud and give you the item result to let you move on including buying and sharing. If there are movies or music or TV shows playing around, you can use the video and music icons to recognize them. What if you need a little help? Don’t worry and now Amazon Fire Phone has Mayday – a live video support. Simply touch the Mayday button and an Amazon expert will show up to help you through live video. What’s more, you don’t have to wait in line, for Mayday response is only 15 seconds or maybe less. This feature makes the flat phone a window with 3-dimensional plane. Dynamic perspective also finds its application in map. Amazon CEO Jeff Bezos showed the audience a 3D view of New York’s Empire State Building. After getting a brief view of Amazon Fire Phone supported file formats, and how its main features function, it is not difficult for you to handle this smartphone. Got DVD ISO Image files? 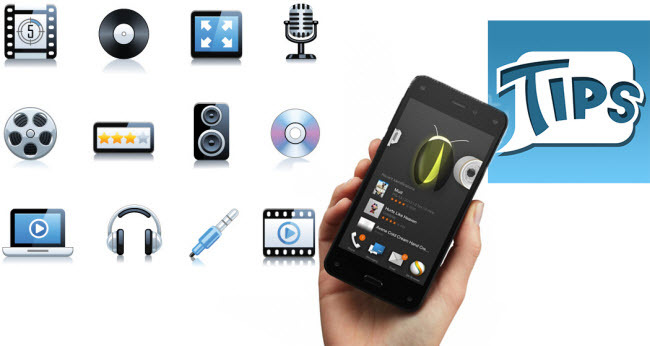 You can play DVD ISO files on Amazon Fire Phone for free enjoyment. Common/DRM videos are also possible on Amazon Fire Phone.